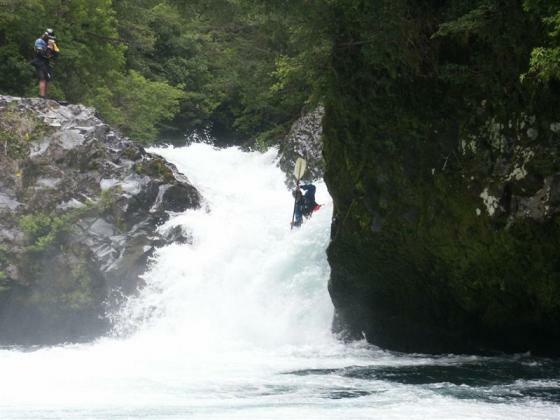 The Upper Palguín is one of Chile’s premier waterfall runs. 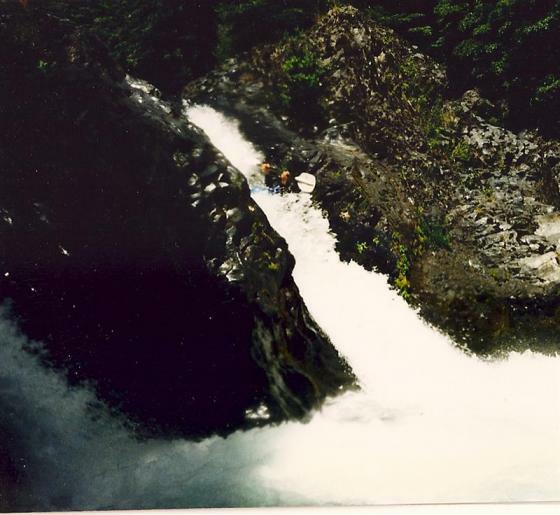 A partial first descent was made in February 1990 by John Foss and Christine Blask. Two years later John returned with Dave Black, John Mattson and Kurt Casey to complete the run. 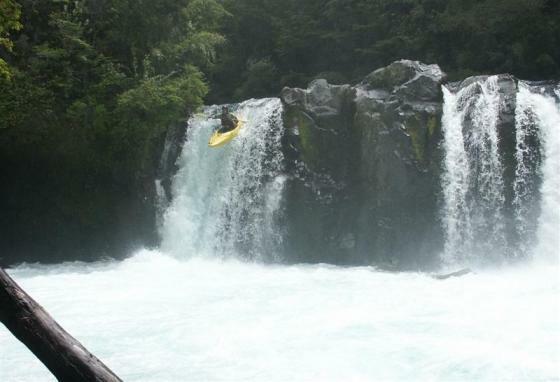 Today the river is a popular day trip with visiting kayakers to the Pucon area. It is located only 20 minutes from town, has easy access, excellent scenery and quality drops. Although the river is small in size and contains significant drops, it has not been limited to only K1 kayaks. Small rafts, Duckies, shredders, Toplino Duos, and perhaps even Hydroslides have found their way down the river over the years. The Palguín never gets too low so apart from a period of high water in the winter/spring months it provides an attractive option for year round paddling. To get to the put in drive East from Pucon 7km and turn right on the international road towards Curarrehue From here continue for another 10 – 15km until you see a sign for the Termas Palguín then turn right. The gravel road (which might be paved in near future) heads up the drainage. From this point set the odometer on your vehicle to “0”. There are four distinct drops on the run. The first is called “Tres Huevones” and consists of 3 drops with part three ending in a 3 meter falls. 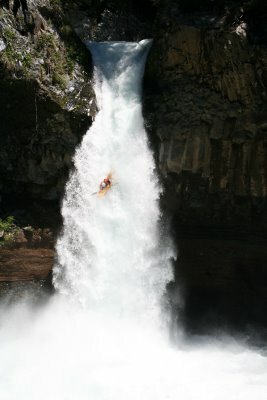 The second rapid, “Eva Luna” is a 5-6 meter falls at the end of a slot canyon. The third rapid is another falls called “Ecstasy” and has a 7 meter vertical drop with runs on on either the left or right of the center rock island. The fourth drop is called “feet first” and is run in the center slot which is a sloping 6 meter sluiceway whose width is slightly more than that of a kayak. Downstream is an almost never run, double-drop falls. 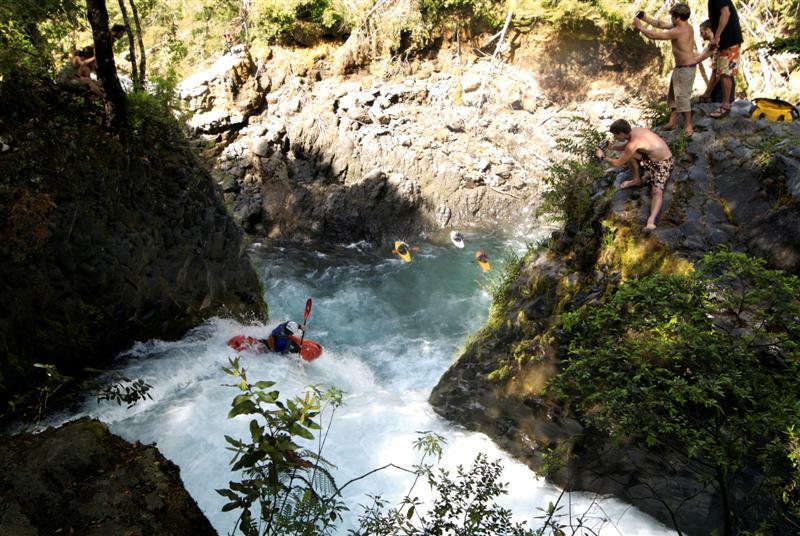 Many choose to throw or lower their boats off the falls and jump the 15 meters into the deep pool below. Do not miss the eddy on river left above this falls. Following the large double drop the river continues through class 2-3 rapids for another kilometer until it passes under a small road bridge. The rapid leading into and under the bridge is known as squeezebox. This is a good takeout and has car access. It is slightly less than 2 KM by road to this point from Upper put in. From here one can continue on what was once called the Middle section if big waterfalls are on the menu. Garcia, Chris Korbulic and Rodrigo Tuschner of Kayak Pucon. From here the river continues dropping at a class four rate until meeting up with the road/takeout point another Kilometer downstream. Note: 4 KM up the Palguín road one comes to a future tea room on river left. This is an access point for spectators wanting to see the big falls. If the land owner is there expect to get charged for entrance.